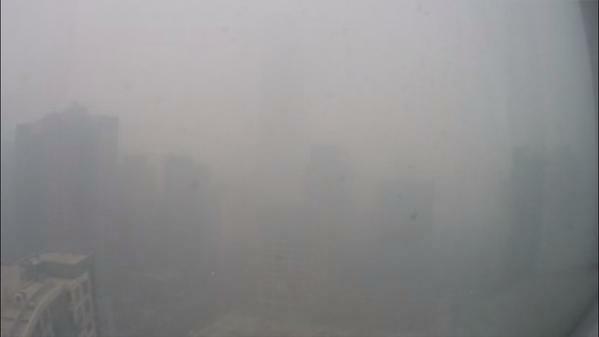 Unsurprisingly, at the same time Beijing's air was reported as "hazardous". 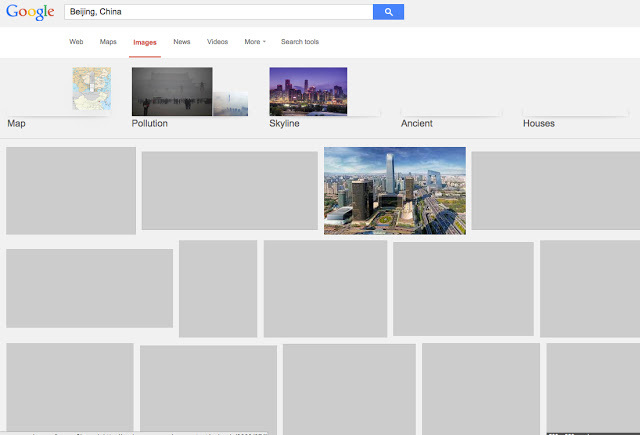 In this case, the grey placeholders for yet-to-load images seemed especially fitting. 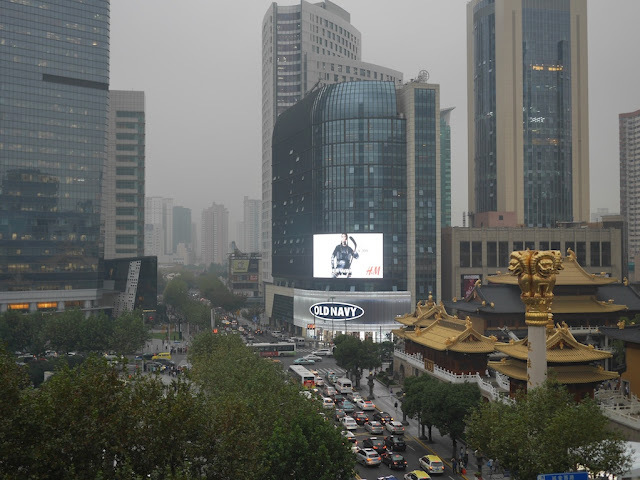 They didn't look very different from Bishop's photo or others of Beijing in heavy smog. Pollution blocking light makes one type of image common. Censorship blocking information helps make the other common for me. The visual similarity may be a coincidence, but once again there was a bit of harmony involving China's air. 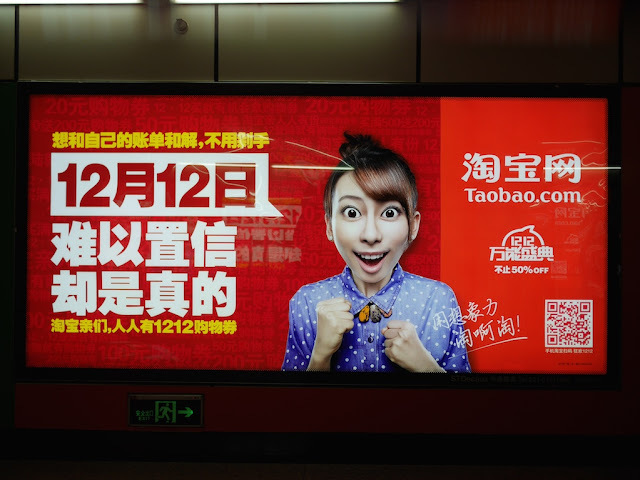 I thought the people's expressions in the ads were incredible as well. 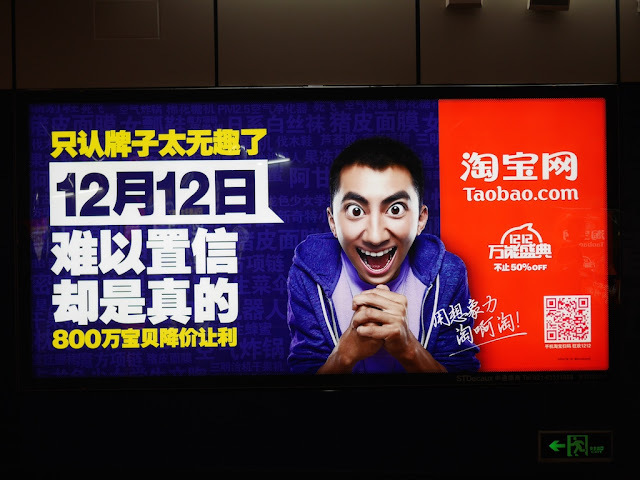 Taobao's sale will presumably do well if its customers are similarly excited. Not far from the M&M's World in Shanghai, yesterday I saw a long line of people outside a store for a globally popular brand. They weren't waiting to buy iPhones. 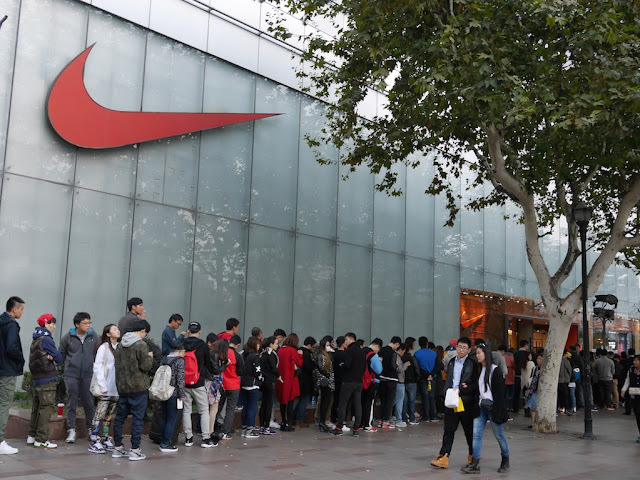 Instead, they were waiting outside a Nike store to reserve the opportunity to buy a special limited edition global rerelease of classic Air Jordan sneakers available today. It is a small example of how Apple isn't the only American multinational company which can generate a line in China. Later that night, a store salesperson told me they only had 300 shoes available there and all were already accounted for. It would be interesting to know how many of the customers planned to later resell the shoes. The other day I saw a stack of square bricks sitting next to a restaurant's outdoor patio at a mall. 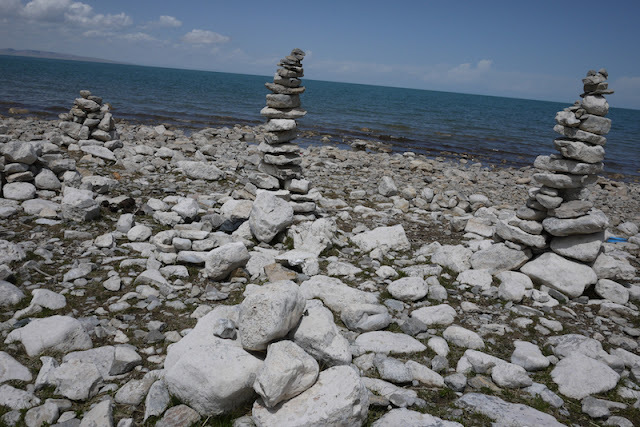 I didn't know whether the person who stacked the bricks had anything spiritual in mind, but they still reminded me of the Tibetan rocks piles I saw next to China's largest lake. See the Qinghai Lake photos I posted two years ago for more scenes at a place far away in many ways from Shanghai. 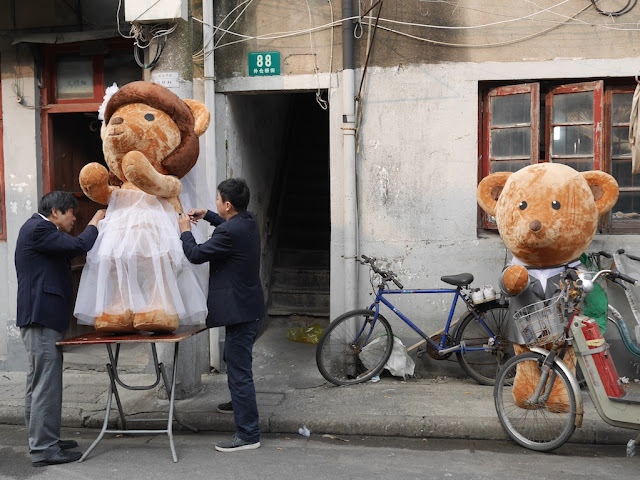 I saw no signs of a "bearish wedding" on a bridge over the Suzhou River one month ago, but there were still opportunities to stage photographic marriage moments. I doubt they will have a difficult time remembering where those photos were taken. I am not sure whether they captured the passing electric bike. I thought it added a special touch. More on non-wedding topics when the speed and reliability of my connection to the blocked-in-China regions of the Internet are more... bearable. 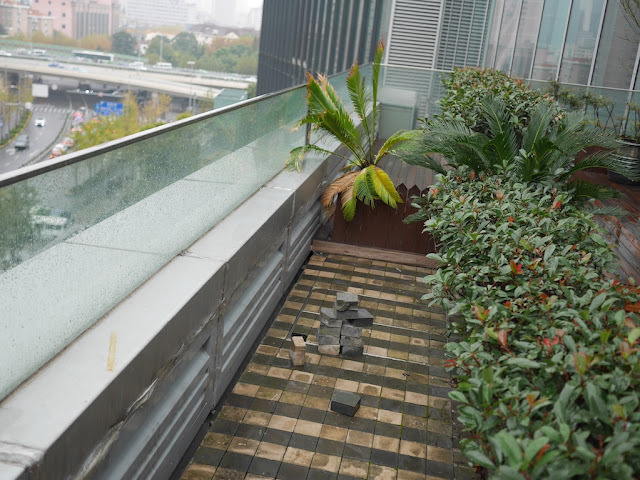 Most trees I have seen in Shanghai still have greenish-colored leaves. 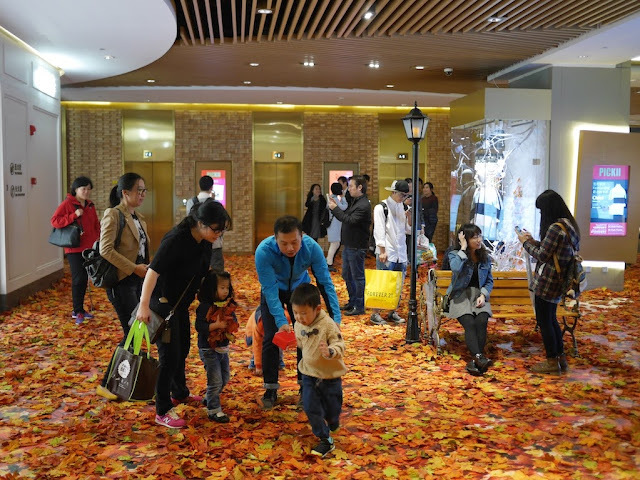 But if people want to enjoy some fall foliage right now, the K11 Art Mall in Shanghai has an answer. The fake fall-colored leaves made out of fabric are placed in multiple locations and seem to be a hit. Some are stuck on the floor, but many others are free to do whatever fake leaves do best. Hopefully no leaf blowers will be used for the cleanup. How can more people be encouraged to donate blood? Increasing blood donation's visibility and making it more convenient seem like reasonable strategies. But is there something that can be done to improve the buses? 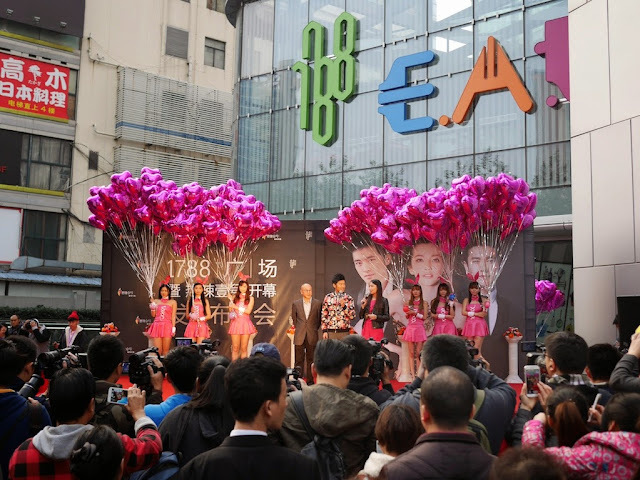 In Shanghai, some thought adding a Hello Kitty theme might be an answer. 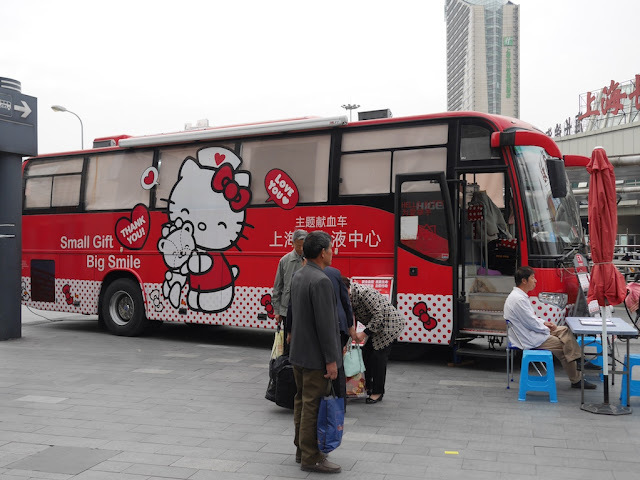 I saw the Hello Kitty blood donation bus in operation between the Shanghai Railway Station and the Shanghai Long-Distance Bus Station. It first appeared this summer, and Kotaku has a collection of photos of its interior. 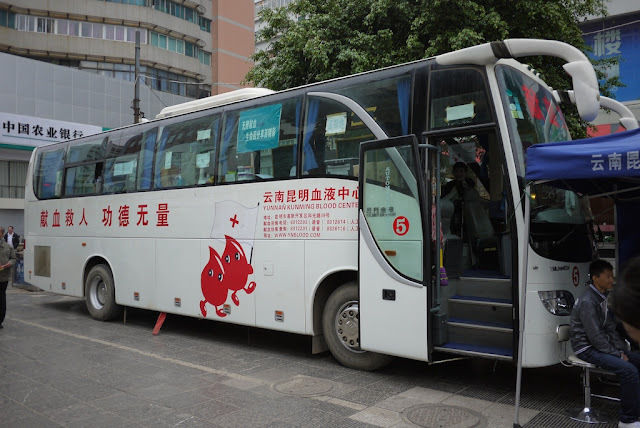 I would be curious to see a study comparing the effectiveness of the Hello Kitty bus versus more typical blood donation buses in different locations. Perhaps a train station isn't where this particular bus could have the largest impact. Whatever the case, it's an interesting tactic to consider and a change of pace from walking blood droplets. 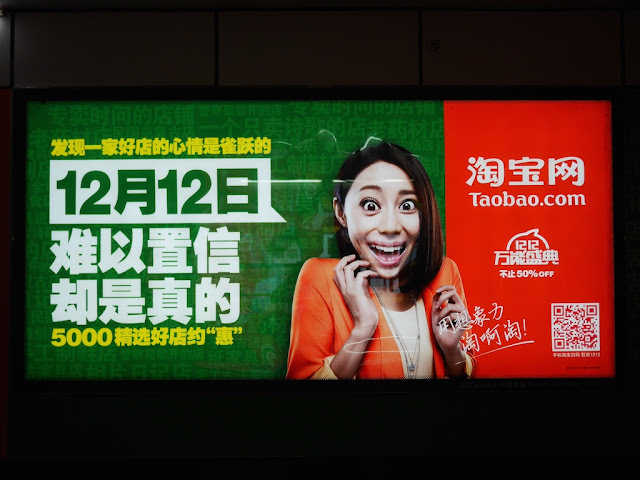 In comparison to promotions I have seen elsewhere in Shanghai and many other Chinese cities, such as a Toyota promotion at the Kaifu Wanda Plaza in Changsha, nothing appeared unusual during the brief time I stopped to take a photo. And I wouldn't be surprised if the many cameramen forming a wall in front of the audience were hired primarily for appearance. 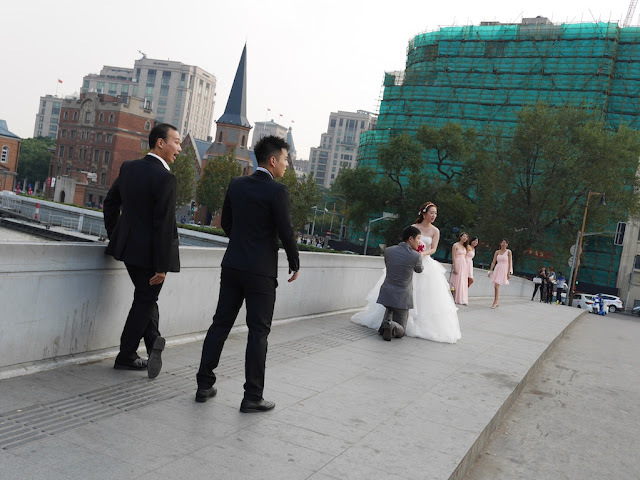 Early this afternoon I noticed an especially harmonious moment in China. 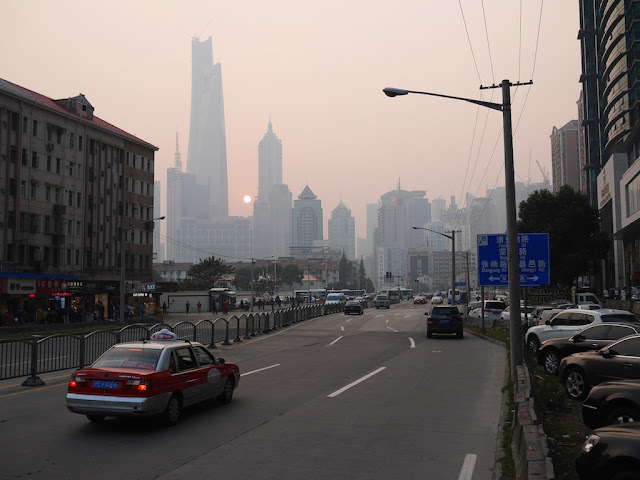 U.S. State Department facilities in Beijing, Shanghai, Guangzhou, and Chengdu reported nearly identical "unhealthy" air quality readings at 1:00 p.m.: 154, 153, 156, and 154, respectively. A 190 reading from Shengyang was less harmonious, though still in the "unhealthy" category. My experiences of days with obviously bad air in each of these cities easily come to mind. I am also reminded of similar days in many other Chinese cities. Sometimes I expected it, such as in Shijiazhuang which I knew was in a region with many coal-based power plants and industries. Sometimes I did not, such as in Liuzhou which is set in the midst of incredible natural scenery. Now that hourly and daily information like the above is available to check, I wonder how many times in the past a blueish sky tricked me into thinking the day's air wasn't so bad. In other words, the overall air pollution was probably worse than I thought. And I had already thought it was pretty bad. 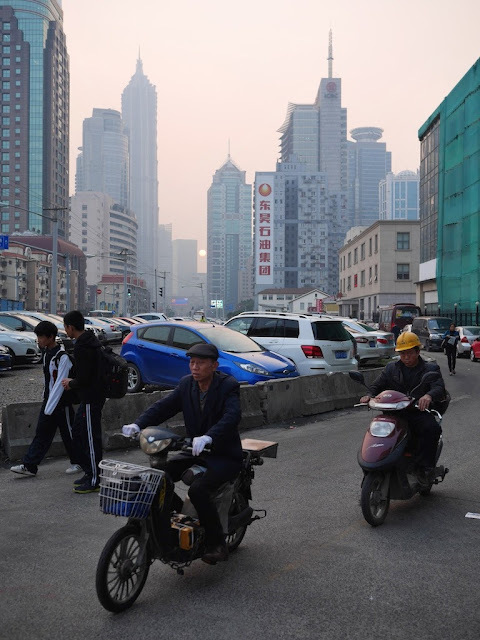 The above readings are just a snapshot of ever-changing pollution levels from single locations in only the few Chinese cities covered by the U.S. State Department. 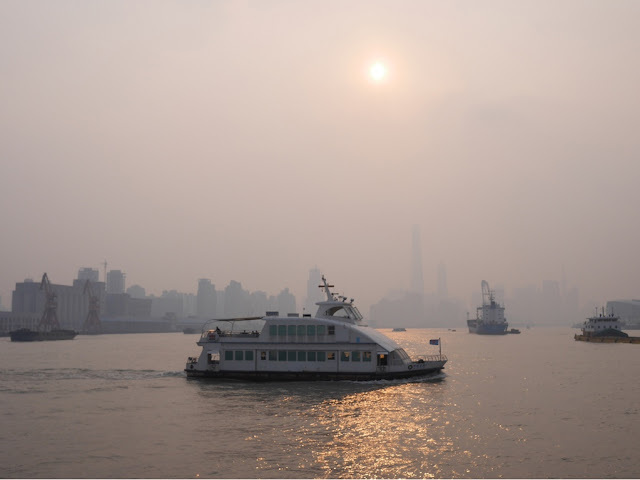 Yet their momentary similarity despite coming from very different geographic regions is at least symbolic of the fact that air pollution is a widespread problem in China—presumably not what the Chinese government has in mind when it mentions "harmony". 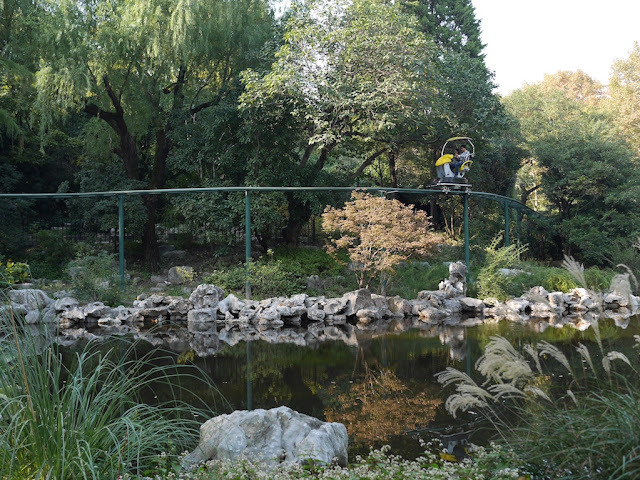 Although Beijing may receive the most attention, avoiding it or even all of the above cities is not enough to have a good chance of finding regularly clean air there. You could even find worse. 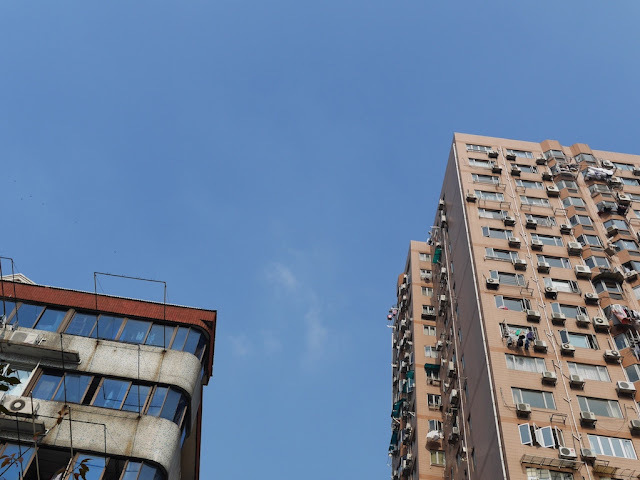 When I looked up while walking outside this morning in Shanghai, the blueish sky and light patches of white clouds encouraged me. In this case, Shanghai residents can't even say "at least it's better than Beijing", where instead of 163 the air quality index at the same time was "only" 115—still far from good. For me, it's a reminder that, although they receive the most attention, the more obviously bad air days are not the only ones to be concerned about. More on this theme later. In an unusual note, [The New York Times] said in its story that it held off publishing the 3,600-word article for a year after the newspaper's representatives met with White House officials. It said the White House had asked the paper not to publish the story at all, "arguing that it could jeopardize continuing investigations and alert would-be terrorists that they might be under scrutiny." And the Times has itself acknowledged that it "has come under fire in the past for agreeing to government requests to hold back sensitive stories or information". The Times has no intention of altering its coverage to meet the demands of any government — be it that of China, the United States or any other nation. Nor would any credible news organization. Technically speaking, the White House's requests may not count as "demands", and the Times carefully writes "has no intention". At the very least though, as Bill Bishop wrote, their claim is "a bit disingenuous". The Times has indeed altered its coverage in the name of U.S. national security — something surely not lost on the Chinese government. Both the U.S. government and the Chinese government desire to limit the spread of information that could negatively impact national security. Yet they differ significantly in how they try to achieve this goal and how they define "national security" — no small matter in the Times' predicament in China. In painting a misleading picture of its own willingness to alter coverage, the Times does not provide "the fullest, most truthful discussion of events and people shaping the world" but does provide an easy excuse to dismiss their argument or question their intentions. And in doing so, the Times misses an opportunity to make more nuanced points useful for discussing how foreign journalists operating with greater freedom could be to China's genuine benefit, including its national security. 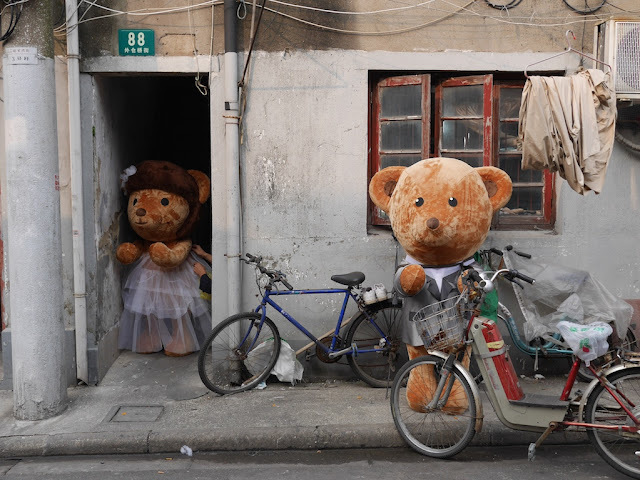 The title's pun is probably more than enough, so I will refrain from providing captions to these scenes in an alley not far from Shanghai's South Bund Fabric Market. I took the photo while on board another ferry traveling in the opposite direction. Most of the other travelers brought their motorbikes along for the ride. This route would be a long walk from the one with the blue sky ferry. 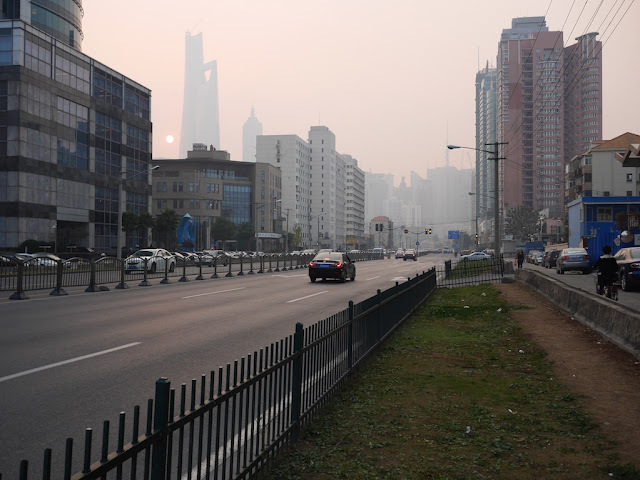 And as with my walk down Pudong Avenue, the air pollution was easy to see but a blue sky was not. 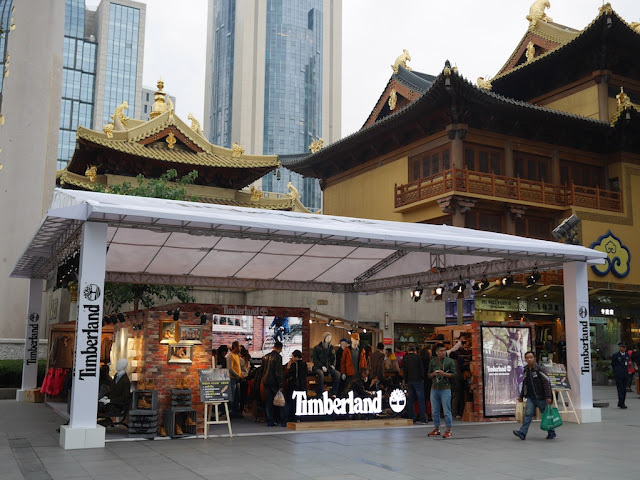 Today in Shanghai's Jing'an district, I saw an outdoor promotion for the American outdoors wear retailer Timberland next to the Jing'an Temple. It made me think of another view of Jing'an Temple — one which included a store for Old Navy, an American clothing retailer owned by Gap. And yes, when I took the photo, the digital billboard above the Old Navy store was displaying an advertisement for the Swedish clothing retailer H&M, prime competition for Gap. None of H&M's 20 stores in Shanghai are in the immediate area, but one is only a single metro stop away. Fate or chance brought me to Pudong Avenue in Shanghai late Thursday afternoon, and I decided to take a long walk to my next destination. Fate, chance, or "progress", also brought me and many others easily visible air pollution. 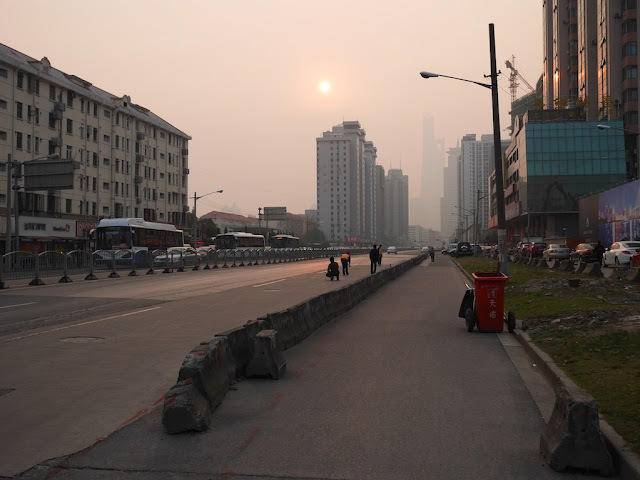 Below are several photos I took as the sun descended while I walked down Pudong Avenue towards the Lujiazui financial district. 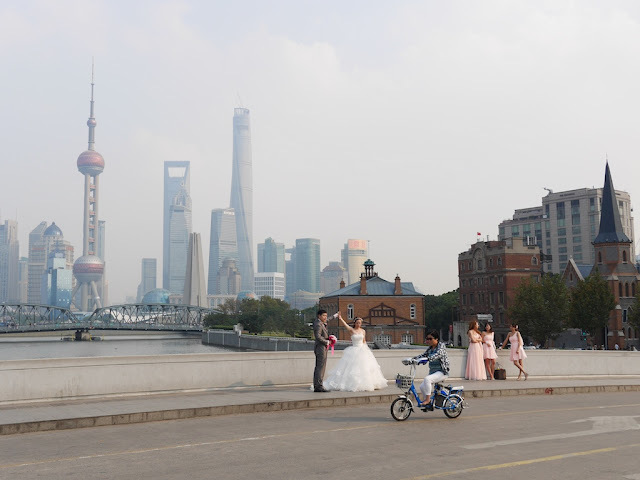 Regardless of the prominence of Shanghai's iconic towers in front of me, the pollution seemed to stay the same—once again, a reminder of what is shared with everyone. 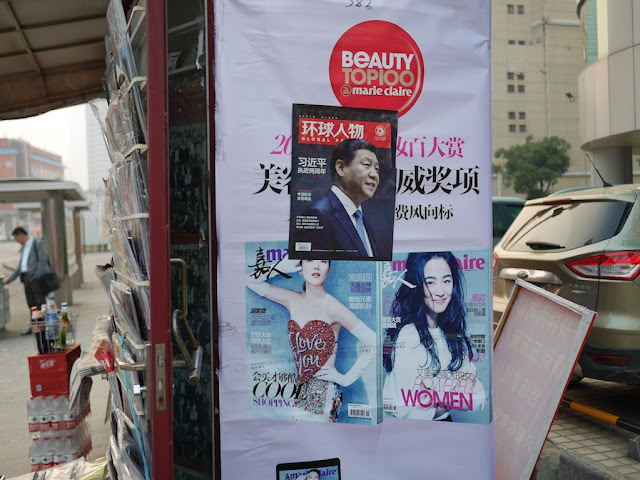 *To be clear: that is copy of a cover with China's president Xi Jinping for the Chinese magazine Global People (环球人物) placed on top of an advertisement for the China edition of international women's magazine Marie Claire. Any mentions I have seen assume the numbers in the image are U.S. specific, and I will do the same. I don't know the original source for the image, but the earliest mention I can find is by a Reddit user in a post which inspired many others. Which in turns leads to points that Americans don't have as much purchasing power as they once did. 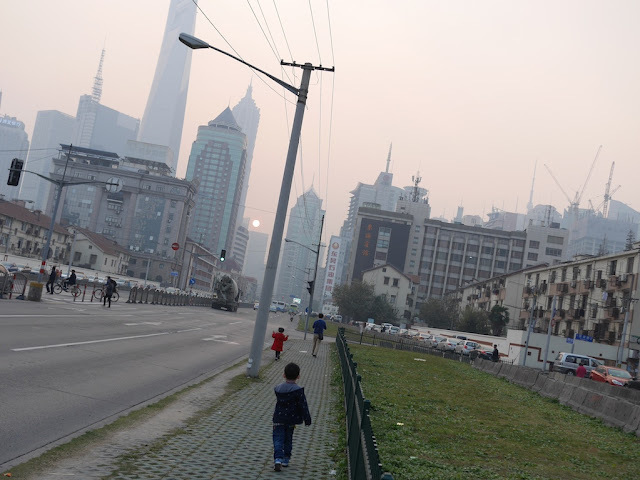 Average annual income for a family in 2012 was 13,000 renminbi, or about $2,100. When broken down by geography, the survey results showed that the average amount in Shanghai, a huge coastal city, was just over 29,000 renminbi, or $4,700, while the average in Gansu Province, far from the coast in northwest China, was 11,400 renminbi, or just under $2,000. Average family income in urban areas was about $2,600, while it was $1,600 in rural areas. 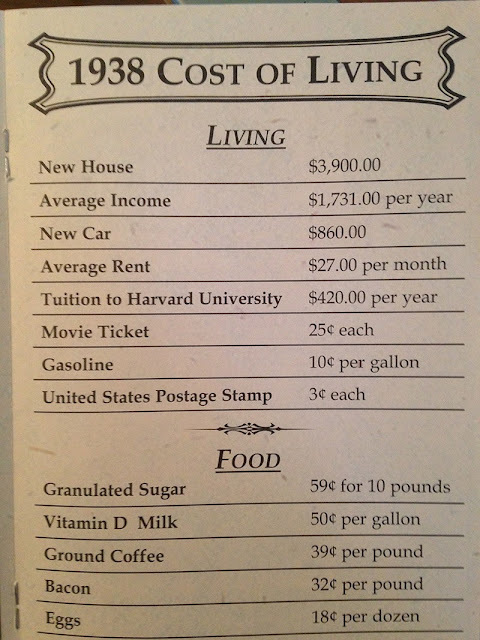 Yet while many people in China make the same or even less than the average American in 1938, even without any adjustment for inflation, they can't get anything near those low 1938 prices for many of the items. In fact, for some items they could be paying more than what people in the U.S. are paying today. The more-expensive-in-Hangzhou goods, such as eggs and gasoline, are highlighted in red. And there are many other items to look at, such as iPhones (more expensive in China) and a popular economic indicator — Big Macs (more expensive in the U.S.). Using examples which may especially resonate if you have lived in both China and the U.S., Chovanec explains there is of course much more to consider, including costs of services, than the above chart when comparing people's purchasing power in China and the U.S. 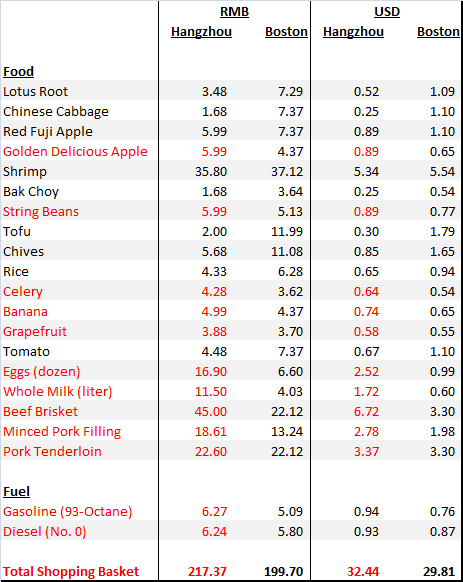 But as the chart suggests, it is not hard to find goods which cost more in China, and you cant make tea eggs or stir-fried egg and tomato, both common in China, without . . . eggs. All of this is simply to say that when wondering how to interpret the latest news of China's economic growth, consider that many in China are living with a 1938 U.S. salary or less and spending it in a 2014 China. It isn't high-speed rail . . .
. . . but it has a scenic view. Unlike a roller coaster in Hengyang, Hunan, I passed on taking a ride—which costs 20 RMB (US $3.27) for two people, more than a ferry or an M&M's World bus-train. Except for a larger crowd, most at the M&M's World in Shanghai seemed the same as when I first visited in August around its opening. 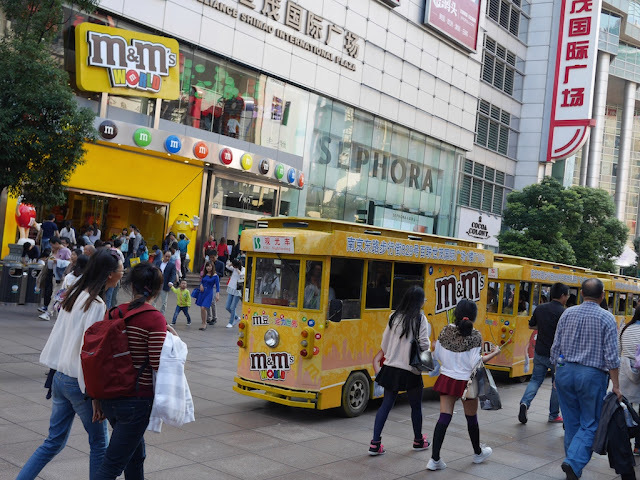 Something I didn't see before, though, was an M&M's World themed sightseeing bus-train on the adjacent Nanjing Road Pedestrian Street. A ride on the vehicle, which travels the length of the pedestrian street, or others with different advertising costs 5 RMB (about US 83 cents), more than double the cost of the cloud-themed ferry not too far away. Set a course for adventure. 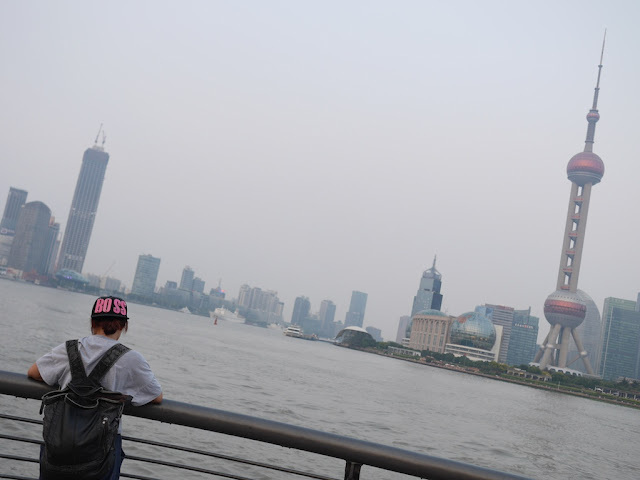 Shanghai's Dream Boat promises something for everyone. 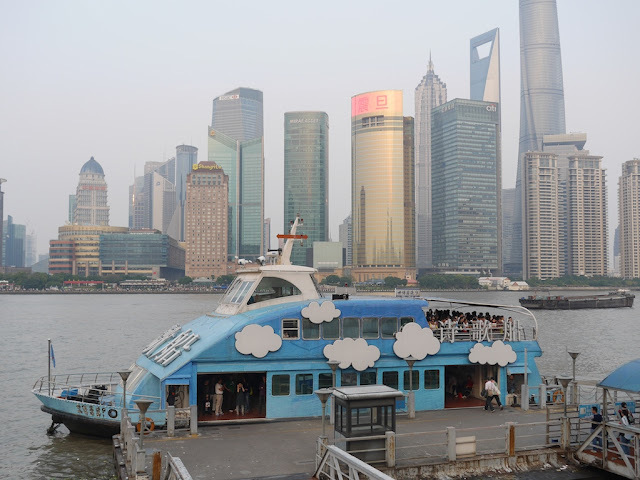 Or, if you prefer more mundane descriptions, the above is a boat for one of Shanghai's 18 ferry lines connecting Pudong and Puxi across the Huangpu River. It only costs 2 RMB (about US 33 cents) for a single trip. Other nearby boats offer more extensive tours on the Huangpu but they cost much more and usually don't include puffy clouds. 1. For an eye-catching overview, see "30 Days Later: A Month of Hong Kong Pro-Democracy Protests in Photos" by Zhang Xuejian and Te-Ping Chen. Many of us [Hongkongers] support and understand the students who remain in Admiralty, Causeway Bay and Mong Kok. So far, we haven't felt a taboo on talking about it on campus. But the conversations are usually only among the Hong Kong students. . . . Some [mainland Chinese students] are curious and come to ask what's happening in Hong Kong when they see the pictures we spread through WeChat. But they just view the movement as useless political and social unrest. They say 'take care', but that's it. Few want to know anything more about why so many young Hong Kong people have taken to the streets. The protesters’ vulnerability has in fact been re-engineered as a force multiplier. On an average day, attendance does not exceed a few hundred, with crowds swelling in the evening, after part-time supporters are done with work or school. But numbers grow at moments of crisis and at any time the camp is believed to be under threat from the authorities. The effect is to make the camp untouchable, at least for now. He also asks "How did people so young get to be so good at protest?". For his answer, which does not mention manipulative “external forces”, and more about the various dynamics at work in the protests, see here. When the demonstrations erupted in late September, many people — particularly leaders in Beijing — expected power brokers like [Asia's richest man, Li Ka-shing,] to come out firmly and forcefully against the sit-ins and call for a quick return to the status quo. After all, the territory's business elite has enjoyed a cozy and profitable relationship with government officials since the former British colony reverted to Chinese rule 17 years ago, reaping massive windfalls as closer ties with the mainland set the city's property market on fire and supercharged other sectors of the economy. 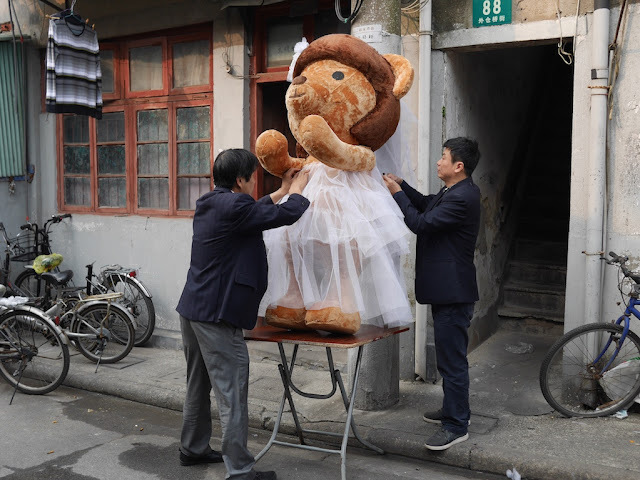 But that calculation may have underestimated the tycoons' support for Hong Kong's more Westernized traditions, and their distaste for its government leader, Chief Executive Leung Chun-ying. See here for more about how Hong Kong's tycoons have largely kept silent about the protests and how they may not be united in their hopes.